IDW says: Mike Mignola is one of the preeminent comics creators of the past 25 years. His career was already firmly established, and then came Hellboy. Mike's iconic creation struck a meteoric chord with fans from the very start and has not abated in the 20 years since his debut. 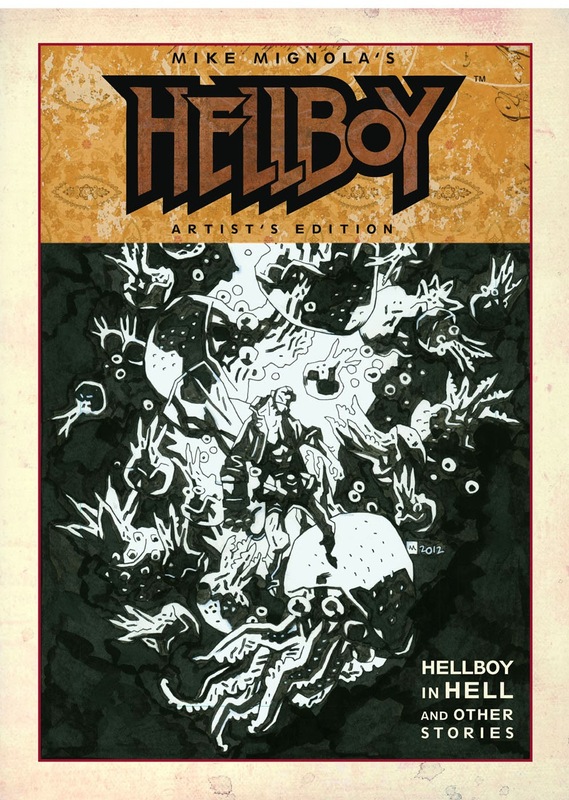 This Artist's Edition features the first five issues of Hellboy in Hell as well as a wealth of historic supplementary material: the first three Hellboy stories--the two initial four-pagers, produced for promotional purposes, and the 10-page story from John Byrne's Nextmen #21-- plus The Corpse, and two other tales selected by Mignola for inclusion. Each page is shot from the original art and showcases Mignola's gorgeous work as closely as possible to the physical page. 200 pages. ROGUE TROOPER CLASSICS #1 Clone war! Nu-Earth, a planet ravaged by war, its atmosphere poisoned by chemical weapons. In this battle-scarred landscape, the Norts and Southers fight where only the Genetic Infantrymen can survive unaided. Rogue is one such soldier, and these are his tales... This series features the earliest stories surrounding one of 2000 AD's best-loved characters, all in color for the first time! (W) Gerry Finley-Day (A) Dave Gibbons. What do you think? For the full list of IDW's April 2014 solicitations, click the jump. I got this Star Trek New Visions last month and really enjoyed it despite my fears Byrne would mess about with the history of the show. I uset to collect all those Photonovels and still have them. ..what a boon they were in the days before videotapes. I am most definitely gonna get this! Hey Karl! I've never heard of a photonovel until I researched what it was writing this. Sounds like a great concept, especially for tv shows as loved as Star Trek. Glad this one is going in the try out tray of your pull list. What one's of the ones you used to collect were your favourites? It had to be Metamorphosis and City on the Edge of Forever that I liked a lot. I recall I had a Close Encounter of the Third Kind photo novel also. I was just talking Close Encounters today Karl - the people I was with had forgotten it, so glad I'm not the only one who remembers!